Since 1992 we have been providing private adoption services to the Greater Ottawa area in Ontario, Canada. We provide home study, education and a variety of support services to prospective adoptive parents, birth parents and families touched by adoption. We have successfully helped hundreds of individuals, couples and families on their adoption journey and are dedicated to helping families come together and thrive through the world of adoption. If you are considering adoption and reside in Ontario, you will find many of the answers to questions you may have here on our site. Adoption is a wonderful way to build a family. We have helped many individuals and couples explore and ultimately build their family through adoption. There are several different ways to adopt and we are here to help you determine if adoption is right for you and which path(s) is best for your situation. We encourage you to click here to learn more about the various options to adopt and the process involved. Are you pregnant and are not sure what to do? There are several options you have and each should be considered carefully. We can help. Please click here for more information. A Canadian bestseller, Rosie's Family is an educational children's picture book written by Lori Rosove, the private adoption practitioner behind The Adoption Source. 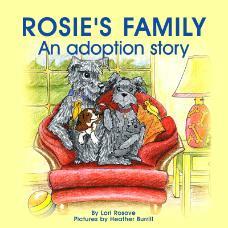 Rosie’s Family is a story about a beagle named Rosie who was adopted by a family of schnauzers. The book takes the reader through a series of questions that Rosie has about adoption and offers guidance for parents on answers to these questions. To read reviews and to purchase Rosie's Family please click here. Rosie's Family is now available as an e-book!